Hosting an event can be such an exciting way to bring people together, be it for a wedding, a corporate gathering, or a party. 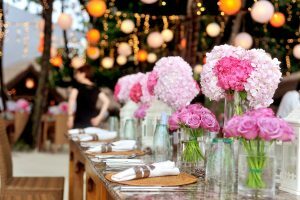 When beginning to plan an event, we usually get an image in mind for what we want out event to look like and what atmosphere we expect it to have. If your first vision for your event is of an indoor venue, I urge you to read ahead and take note of all the benefits to hosting outdoors! The first thing you might be worried about is losing the class that comes with an indoor venue. When most people think of tents, they don’t think of class. That’s sadly misinformed! Tents can be ordered to fit whatever theme you have planned and decorated to the nines. As a matter of fact, tents lend themselves to even more personalized experiences as they can be arranged in whatever way suits your needs best. You can order many different sizes so that the space isn’t too empty nor too full and if you’d like, you can rent multiples. Big, beautiful venues can be just the thing for something like a wedding. You, of course, want such a special day to be held in a special place, right? Well, that special place doesn’t need to be a pricey indoor venue with a waiting list a mile long. Renting a tent for an outdoor wedding can be just as beautiful and it’s much easier to find a spacious outdoor area to reserve than to fit yourself into a venue’s busy schedule. One of the big benefits to hosting outdoors is that there’s so much space! Indoor venues can get so crowded and begin to feel claustrophobic. Hosting your event with a tent is a great solution. If things are a little crowded inside, there’s plenty of room to expand past the covering. It becomes easier to mingle and weave through the groups of people loitering around. The spacious advantages of hosting outdoors make events family-friendly as well! Taking your kids to an event can be such a hassle, especially if it’s indoors. Outdoor events give kids enough room to play nearby without disrupting the adults catching up with each other or networking. Last but not least, outdoor events are more scenic. Indoor venues can feel so closed in. When you host outdoors, you open your event up to all kinds of possibilities. Time vows to align with the sunset. String up lights and dance under the stars. Host in a natural garden filled with flora that will give your event an aesthetic no indoor venue could match. The ways you can use tents to your advantage are so numerous, you’re only limited by your imagination. Don’t worry about the lighting or the temperature. The accessories you can rent with your tent will have you covered. Just decide on the vision you want to bring to life and imagine it outdoors and it can become a reality with Varsity Tents.